Boy and Rick fished an evening session at the famous Bungsamran Lake in Bangkok. The anglers quickly got amongst the catfish with a series of Mekong?s to the mid forty kilo mark. After a quiet spell of almost an hour a savage take signaled the beginning of a long drawn out battle lasting some forty five minutes. 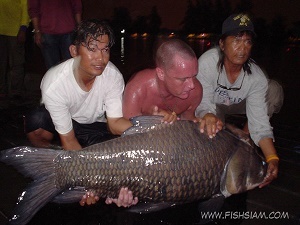 Towards the end of the battle the extremely large Giant Siamese Carp managed to find the sanctuary of the snags! After a few fraught seconds the braided line pinged free and the carp was quickly brought to the waiting net. Whilst netting the carp the anglers observed that the fish was an extremely large specimen which required two people to hoist the monster from the lake! With no scales on site and the anglers not wishing to retain the giant carp the fish was estimated to weigh in the region of 60kgs. With an overall length of 1.4m and a gigantic girth this fish was truly a magnificent specimen.